15 April 2010, at 12:05p.m. GERMANY On time for VIV Europe 2010, Big Dutchman can announce an impressive sales success: the company has already equipped 25 million places for laying hens with their aviaries of the Natura product family. On the occasion of a symbolic hand-over of keys in Laar (Emsland), managing director Bernd Kuhlencord, said: "We are very proud that Natura has become the leading system for floor, free range and ecological bird management and thank our customers who have helped to reach this goal." The significant milestone for alternative management of laying hens has been passed with the new construction of two state-of-the-art houses for 45,000 birds each. Not far from the Dutch border Roel van Zetten, a well-known and appreciated expert from the Netherlands, has equipped his new houses with the Big Dutchman aviary, Natura Step. On behalf of Big Dutchman and its local agency, Frilim, Mr Kuhlencord said: "Thank you very much for your confidence! We wish you a lot of success." Mr van Zetten replied: "I am glad that we were part of this process. We are very pleased. Keep on going like this!" He was impressed with the cooperation, and expressively praised the good assembly team. Natura-Step is the youngest member of the large Natura product family. This aviary for efficient floor and free-range management can also be installed in single rows. This is due to the stepped construction of the system allowing the birds to move between the different levels without leaving the system. This also makes them reach the integrated nests very easily – and the result is a very low share of mislaid eggs. 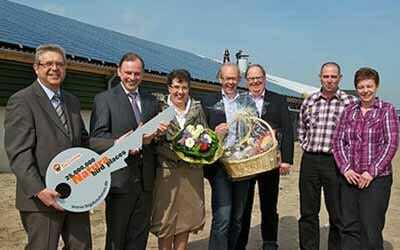 Happy faces on the occasion of the symbolic hand-over of keys: Big Dutchman managing director Bernd Kuhlencord, Roel and Ans van Zetten, Big Dutchman sales consultant Henk Leeuwis, Seine Snippe from the Dutch Big Dutchman agency Frilim B.V. as well as the farm managers, Gerrit and Jorita Altena.